Help to uncover gravitational waves with Gravity Spy! We are very excited to have the beta test running for Gravity Spy, a Zooniverse project that combines human classifications with computer machine learning algorithms to help the LIGO team improve their search for gravitational waves. This project is run by the Gravity Spy team, made up of LIGO researchers within the Center for Interdisciplinary Exploration and Research in Astronomy (CIERA; ciera.northwestern.edu) at Northwestern University, LIGO researchers at Caltech, machine learning researchers at Northwestern University, crowd-source science researchers at Syracuse University, and Zooniverse web developers, with the help of wonderful volunteers like you. Provide data needed to train machine learning algorithms to recognize different classes of glitches, signals from non-astrophysical sources like small ground motions near the LIGO observatories, so the LIGO team can better identify true gravitational wave signals. On December 26th 2015, LIGO detected its second full-fledged gravitational wave event, dubbed GW151226 (the numbers signify the date it was detected). This detection was announced on June 15th 2016 at the American Astronomical Society’s 228th conference. The masses of the two black holes are smaller than those of the first confirmed event (GW150914) – about 8 & 14 solar masses for GW151226 compared to 29 & 36 solar masses for GW150914. Though less visible by eye in the data, sophisticated search algorithms that match theoretically-produced templates of the gravitational waveform were able to extract it from the data and build up enough statistical confidence to declare it as a detection. The system was estimated to have merged at a distance of 1.4 billion lightyears, and due to its lower mass stayed in LIGO’s detection band for a full second (5 times longer than the more massive GW150914). Time-frequency plot of the second confirmed gravitational wave event – GW151226. Light colors represent higher energy. This discovery further solidifies this nascent field into astronomy, and has given astronomers a new sense to explore the Universe. The next observing run of LIGO will commence later in 2016, and due to upgrades the instrument will be more sensitive, increasing the rate at which LIGO should detect these types of astrophysical events. In addition, more detectors will be joining the network of gravitational wave observatories over the next few years, which will further constrain the location at which these events occur in the cosmos and increase the likelihood of detecting an electromagnetic counterpart to a gravitational wave event. More great discoveries to come! 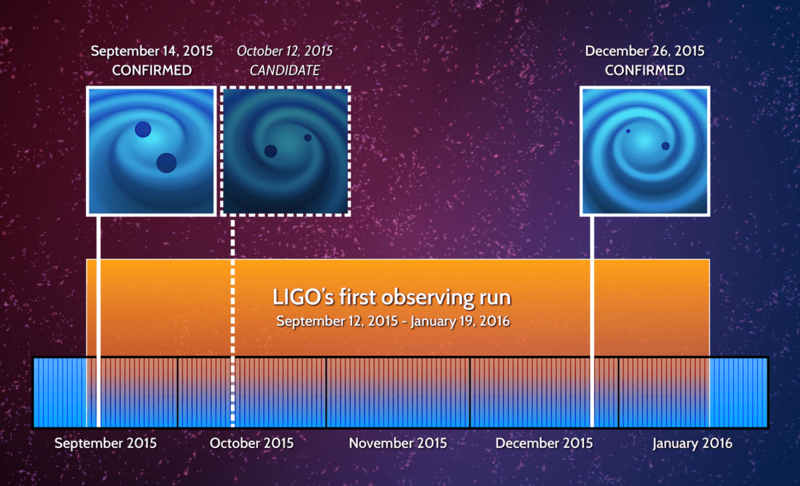 Synopsis of LIGO’s first observing run and the birth of gravitational wave astronomy. Amazing ~ the 2nd gravitational wave finding ~ Saluti!